The Main Hall is ideal for clients looking to hire a large space. Regular clients include local clubs and societies such as sports, dancing, drama and keep-fit groups. 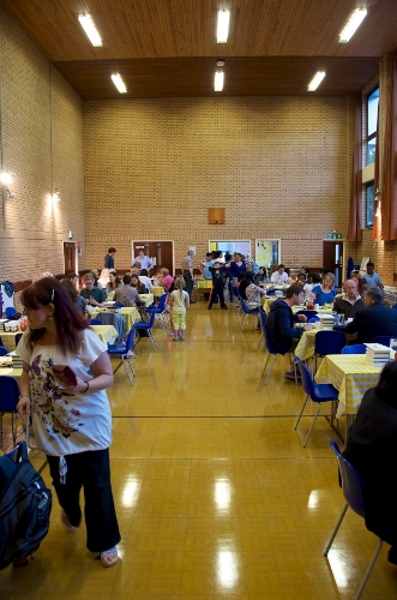 The hall has also been hired for charity fundraising conferences and functions. Large area approximately 10 metres x 20 metres. Large capacity (200 people maximum). An 8 metre high ceiling makes the hall suitable for bouncy castles and other large soft-play installations. Access to Small Hall via set of double doors. Chairs and tables for up to 200 guests. Rectangular tables seat six people (four feet long) or eight people (six feet long). These are included in the hire charge. The hall is marked for badminton and basketball courts. Basketball hoops are installed. Over-head lights for sports and other well-lit events. There are also wall-mounted spotlights for evening events where a change of atmosphere would be appropriate. Toilets with facilities for people with limited mobility.